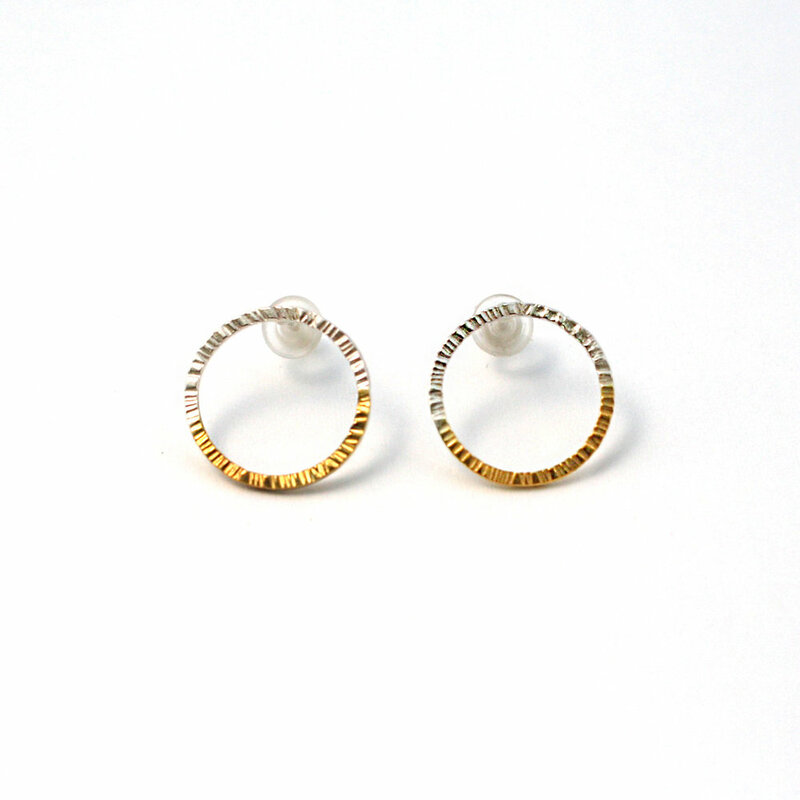 I just received my Reveal Earrings from Hsiang-Ting Yen & I am thrilled with them. I love the unexpected mix of materials, the asymmetrical design punctuated with the beautifully faceted chalcedony dangles. These truly make a statement. HTY remade a long ring that we were devastated to lose. She worked from photos and our input and exceeded our dreams of resurrecting this treasure for us. While we were at it, she designed and crafted earrings and a necklace using leftover materials from the ring. She's true artisan and handles her business with a business acumen that is reassuring and so professional. You will love her work! My fiance and I really loved working with Hsiang-Ting to create our custom wedding bands and my custom engagement ring. From the very start, she was really passionate about hearing our ideas and did amazing work turning those thoughts into beautiful designs. Our rings suit us both so well, and all the little details are just right. I also loved that we got a lot of insight and input on each step of the process. I've admired Hsiang-Ting's work for some time. Both her signature collections and her custom work. My husband purchased a pair of earrings for me for our anniversary last year. They are my favorite earrings, and I love the way I feel when I wear them. I highly recommend HTY Jewelry if you are looking for a custom or unique piece of jewelry that expresses your personality. HTY Jewelry is my go to for a beautiful custom gift. She always helps me to select just the right piece that is classic and elegant. I continue to refer friends to her who need a piece of jewelry re-purposed and customized because I know they will be extremely pleased with her expert craftsmanship, her designs and her guidance. As a wedding minister, I am always excited to see her beautiful, custom engagement and wedding rings. I have bought several beautiful pieces of jewelry from Hsiang-Ting Yen over the past few years. Her artistry is unique! I have found myself wearing these pieces a lot and invariably receive compliments from others about them. She is also a lovely person -- recently I clumsily damaged a pair of my very favorite earrings which she had created and she was most responsive to my distress, repairing them for me immediately in the midst of one of her busiest seasons. I look forward to following her creative artistry! I just love Hsiang-Ting's work! I have a pair of earrings from the Reveal Collection. She made a pair of custom cuff links for my husband (which he says are one of his favorites). She also saved me by making 2 necklaces on short notice for birthday gifts - each of which were well-received! I highly recommend Hsiang-Ting as being easy to work with and also for having great jewelry designs. I am proud to call her a friend as well! This ring is a beautiful piece of art. I've never seen anything like it, and I get compliments every time I wear it. It's actually quite versatile, and can be worn with more formal looks or with jeans and a t-shirt. I had an old only sentimental value super sparkly CZ with a broken band. Ting reset the stones in a new heavier band for a very reasonable price. It turned out amazing! I was looking for a talented and trustworthy jewelry maker for 13 years to create a ring for the cat eye I received in 2005! I'm so happy I waited and finally meet Hsiang-Ting, she was able to create a ring that really corresponds to my personality and to the styles I like. She kept me informed of the steps and provided pictures. It was fast as well, within 7 weeks I got my custom ring ready to wear. I love my new ring so much! Thank you for your precise and creative work! I highly recommend to contact Hsiang-Ting would you look for a special jewelry!! I feel very fortunate to have finally met someone that can please the exquisite, and unique taste of my wife, complimenting her independence and confidence. Mrs. Yen is skilled and creative with her craft, and most importantly has integrity which will give her our business going forward. My husband and I decided to have the diamond from my original engagement ring reset for our 40th wedding anniversary. Not only did Ting create the ring of my dreams, but her customer service went above and beyond. I was kept informed of every step of the process. Ting was so professional and easy to work with. The craftsmanship is excellent, and the design stunning. I couldn't be happier with the result. I would absolutely entrust Ting with any project I may have in the future. I cannot say enough positive things about Hsiang-Ting Yen and HTY Jewelry! She has great creative design and artistry. Her work is well-made. Great customer service. She even offers custom jewelry design for a one of a kind piece of jewelry. I am a happy, repeat customer who highly recommends her work. You will not be disappointed, and you will be supporting small business and a local artisan! In honor of the birth of my daughter my husband bought a solitary diamond (which is her birthstone). His idea was to have it incorporated into a piece of jewelry that I can wear and then pass down to her. We wanted something truly unique and something that can become an heirloom. Hsiang-Ting was a pleasure to work with and helped talk us through our options and suggested styles so that it could incorporate well into my current collection while having an appearance that is one of a kind. Since we loved some of the rings we saw on her website she suggested we use my birthstone to compliment the diamond and as a symbolic gesture. I am so excited to pass this art piece along (although I’m sure I’ll miss wearing it myself). Hsiang-Ting created the gorgeous engagement ring that I used to propose to my girlfriend. My now fiance absolutely loves the stunning work that Hsiang-Ting did. Working with her went so smoothly from the design process where she took my abstract and vague ideas and created stunning designs to choose from to the actual process of creating the ring and giving me updates each step of the way. I highly recommend her work. Very quick response to my initial inquiry, and a very creative craftswoman. Glad I found her! Hsiang-Ting's work is amazing! I had a fairly abstract idea of what I wanted when I came to her and she was able to create something beautiful that I could give to my sisters. She is so quick and responsive and I would highly recommend her to anyone. I will definitely come to her again in the future! My boyfriend and I met Hsiang-Ting Yen at a local arts festival in Durham and I was immediately drawn to her station because of her beautifully crafted jewelry. 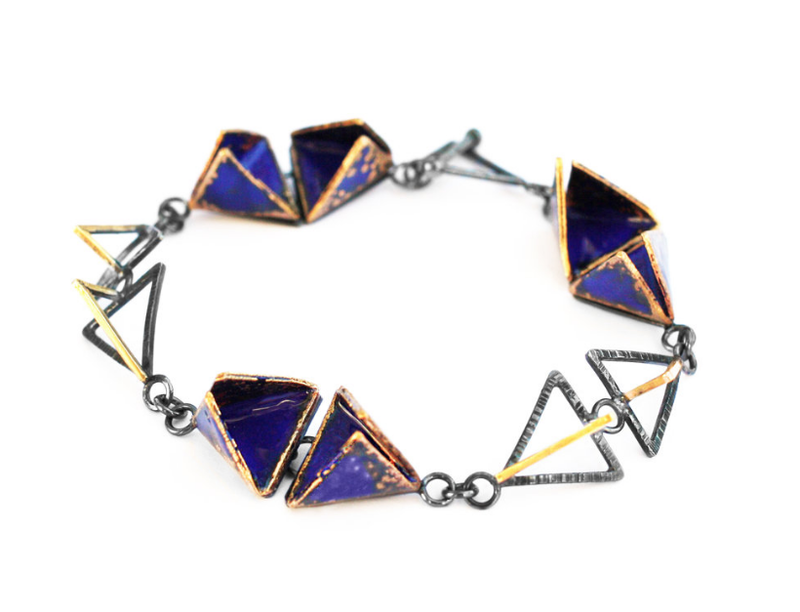 I was specifically interested in a bracelet for the rich color and geometric components. The overall look of the piece was very architectural. I did not expect this piece to be gifted to me for our one year dating anniversary but when it was I was thrilled! The bracelet was slightly too long for my wrist. What I was truly appreciative of was HTY arranging to FT me to discuss next steps to amending the bracelet to fit. She was thoughtful and responsive in the exercise and we met for coffee to talk about the options. She was very helpful and the finished product is beautiful and special. In this meeting she showed me the lovely custom work in her portfolio. She is truly committed to creating exquisite, high quality design in jewelry. "Hsiang-Ting at HTY Jewelry is an amazing artist and made me the perfect 35th Anniversary ring!! She was a joy to work with and everything that she suggested made my ring one of a kind and absolutely beautiful! Thank you Hsiang-Ting"
I ordered a custom sterling silver bracelet from HTY Jewelry two years ago as a treat for my birthday. 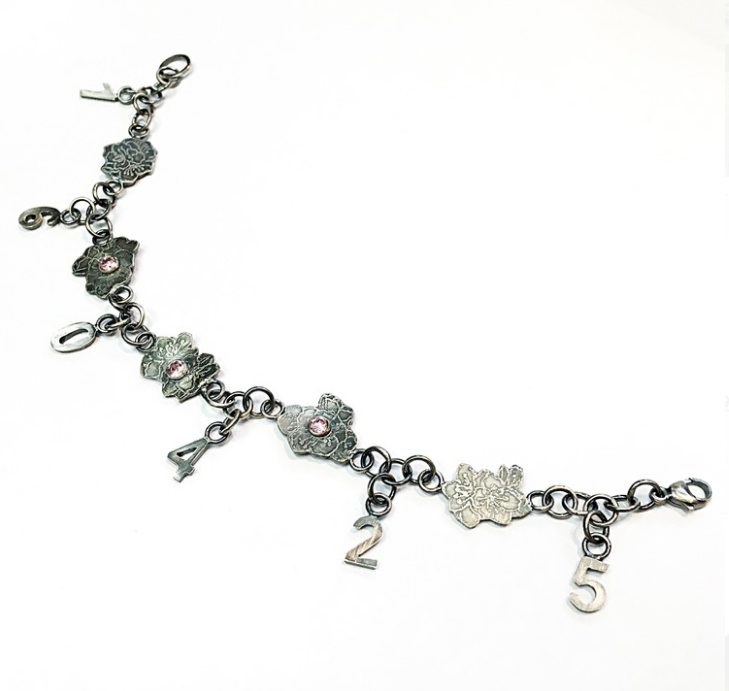 The design contains my favorite flower Sakura and pink zircon with the numbers that have personal meanings to me. The process was very smooth and the finished bracelet is just so beautiful. I've been wearing this bracelet every single day, and it still looks like brand new. Thanks a million! Looking forward to work with you again! I absolutely love them and I get a lot of compliments. They look great with my little triangle studs! "I bought earrings from you at the Bluegrass Festival on Saturday and I've basically only taken them off to shower and sleep since then. (I'm the person who came back after a few hours of pondering...) I'm very glad I decided to buy them because the more I wear them the more I love the design and how they catch the light. I just wanted to thank you via email because I think all artists deserve praise for work that is beautiful. I really like the general style of your work and hopefully the next time I have some "extra" money I can buy another piece from you. 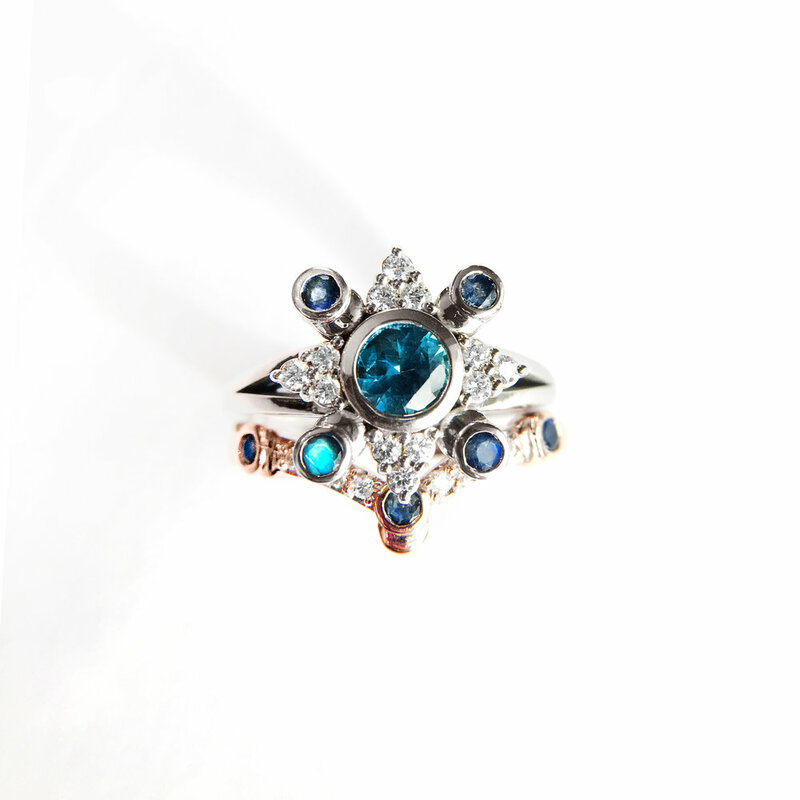 "Hsiang Ting is very well trained and knowledge about many aspects of designing and repairing jewelry. I have several of her enamel and metal pieces that I wear often. When I ordered special gifts she was meticulous, making certain that the color and design were as desired. Most recently Ting helped me address a problem I had when three of my rings were cutoff from my finger in the ER when I broke my arm, my engagement ring, wedding ring and anniversary bands. She redesigned them in a more contemporary design. Seeing sketches and CAD designs throughout the process was helpful. Everything was done on a reasonable timetable and it was hand delivered!" "I waited over 3 years to find the right person to create a spoon ring for me. I know this sounds simple, but it's not. My Grandfather designed this spoon for Gorham Silver. Hsiang-Ting took the time to figure out what I wanted and how I wanted it to fit. Now I get to wear a beautiful ring every day and think about Grandpa Rudy." "Hsiang-Ting is a true artist. Every piece she makes is crafted with such vision and care, and each is truly unique and one of a kind. The pieces of hers I own are easily my favorites and most worn in my collection, and I'm complimented on her earrings basically everywhere I go. Not only is she incredibly talented, she's very sweet and an absolute pleasure to work with!" "I worked with Hsiang-Ting on the design for my wedding ring, and it was a wonderful experience! She had great ideas and vision, helping to guide me to a design that was exactly what I wanted. 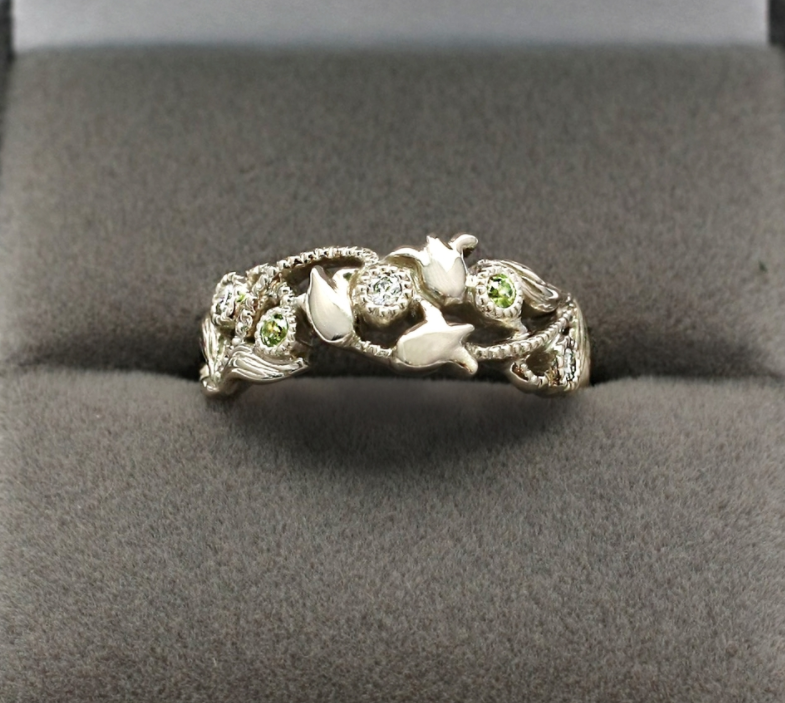 The result was a beautiful art nouveau floral design with lily of the valley motif utilizing diamonds and my birthstone. She was open to redesigns and came to me with several options from which to choose. I will definitely be getting her help in reimagining some of my older jewelry so that I can enjoy it more!!" "I had SUCH an awesome time working with Hsiang-Ting on my wedding band. I really wanted something non-traditional and custom-made to compliment my engagement ring. We met one-on-one so she could get a feel for my style and what I was looking for and she took it from there. The whole process was so much fun, she's an incredible artist who is really good at listening to you and running with your ideas. In the end I have a GORGEOUS wedding band that is completely one-of-a-kind. I am in love with my ring and it is so special knowing that I am the only one with a ring like this, I can't thank her enough! I would highly recommend Hsiang-Ting if you're looking for a custom piece of jewelry!!!!!! "Creative and unique jewelry design , if you like hand made style, HTY Jewelry will be the best choice for you." "Hsiang-Ting made wedding bands for my fiance and I and we were so pleased with our experience and the results! We were not sure what we wanted when we first met with her, but she provided us with several sketches of ideas and different metal/jewel options and in the end we were able to get the perfect rings! She communicated with us regularly throughout the process and provided us with picture updates and requests for feedback. The turnaround was very quick and we couldn't be happier with our rings!" "I ordered some custom earrings for my daughter -in-law for her birthday. I was sent some hand drawn sketches for approval. When they arrived, they were even more beautiful. She loves them!" "Ahh the experience was terrific. Hsiang-Ting made my fiance's engagement ring. I approached her with many specific themes that I wanted to include in the ring, but I had very little knowledge of jewelry making. Hsiang-Ting was wonderfully patient and helpful as we went back and forth on many different looks and drawings until the perfect ring was crafted. When it arrived in the mail it was exactly what I envisioned. Sarah now walks into any room "ring first."..." "I only provided my thought and idea when talking to HT at first time, because I wasn't quite sure what kind of ring I am looking for. However, HT showed me 4 amazing designs based on my words which are all beyond my imagination. After deciding my unique custom-made ring and paying the deposit, the making process was also efficient. The ring was far beyond the pictures could show. It's so beautiful and elegant. I definitely recommend HTY Jewelry no doubt. BTW, during the discussion, I asked her a lot of questions about the diamonds and rings...etc., she was always more than happy to answer my questions." I made customized earnings based on the existing product line as my sister's birthday present, and she just loves it. The earrings have the right size and have a beautiful, astounding germs on it. The shopping experience is highly satisfied. The HTY Jewelry responded my request promptly. They also suggested me the suitable style of the earrings after I sent them my sister's picture. Overall, the earrings and the service provided by the HTY Jewelry are excellent. I will definitely shop at the HTY Jewelry again!